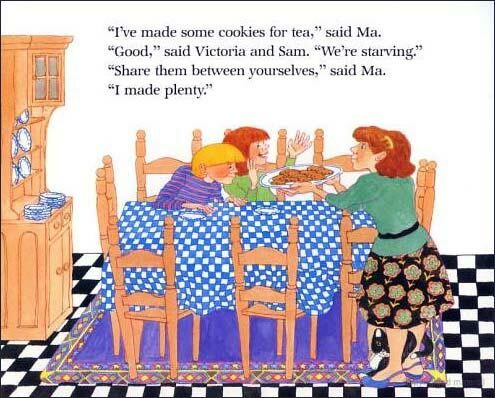 The Doorbell Rang tells the simple story of Sam and Victoria, who were just about to sit down and enjoy fresh cookies when two friends arrive and the four children divide up the cookies four ways. 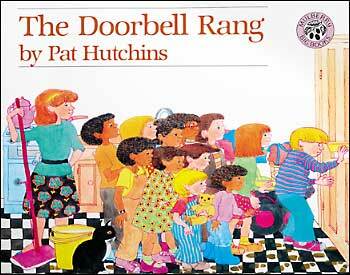 Soon, the doorbell rings again, and then again, and each time the number of cookies per person dwindles. The illustrations in this book are admittedly super dated looking! However, we've finally come to acknowledge that it's not the kids who are turned off by dated illustrations. It's us -- the grown-ups! It's the grown-ups who deem a book 'too dated' simply because we were around back then, so we can recognize the illustrations of our youth. But kids don't. :) So...we are trying to be more 'forgiving' of older books, and consider the storyline a little more strongly. And this is a book that stands the test of time. Sample Pages: Below are sample spreads from inside The Doorbell Rang. We don't love the illustrations -- they look dated and are overly cute for our taste. 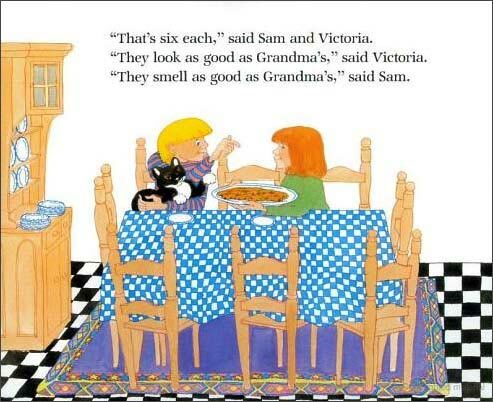 However, we can't deny that this book is great for teaching early lessons on division! And, the storyline is such a natural lead-in for countless hands-on division activities. then, as you go through the story, play out each scenario, drawing new plates equal to the new number that are sharing the cookies and slowly divide up the cookies again and again. Physically dividing the cookies makes a big difference. The book grabs the kids interest and provides the story structure, but kids in early division lessons need to see the division in action! I don't mean to be explaining this in too much detail, but it really does make a difference in their understanding.